In Climate Zone 3, is installing rigid foam on the exterior side of the wall sheathing worth the effort and expense? 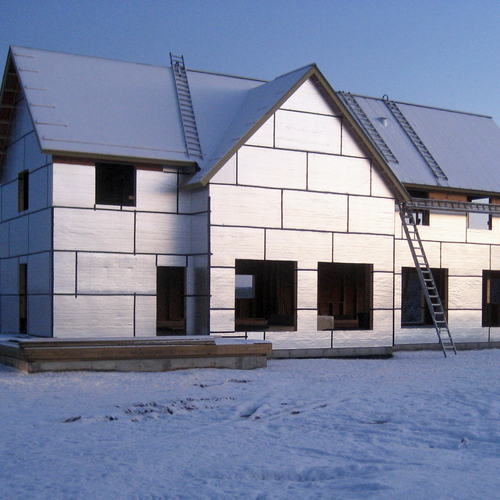 Insulated sheathing is one option for exterior walls. Huber makes Zip R sheathing that combines structural sheathing with a layer of foam insulation in thicknesses ranging from 1 inch to 2 1/2 inches. Writing from Climate Zone 3, Farm House seems to have worked out many of the details for the dream house he plans to start building in a few months. That’s the plan: no rigid foam on the roof, but 1 inch of rigid foam on the exterior walls, plus a vented rainscreen and siding. Can Exterior Foam Insulation Cause Mold and Moisture Problems? That said, if Farm House decides that it’s a good idea to increase the R-value of the wall assembly or reduce thermal bridging between the studs, he could take the advice of Steve Knapp and use Zip System insulated R-sheathing, which combines structural sheathing with foam insulation. 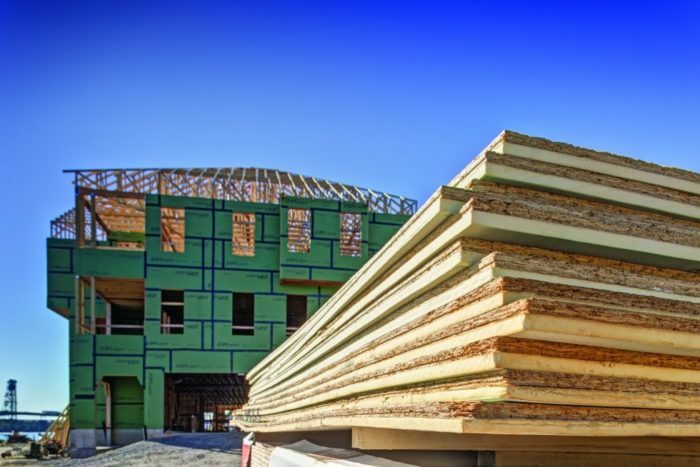 R-sheathing can take the place of conventional OSB or plywood sheathing. It comes in various thicknesses, with R-values ranging from 3 to 12. Dana Dorsett won’t try to convince Farm House, either. He suggests using BEopt, free energy-modeling software available from the National Renewable Energy Laboratory. Then, given the good solar exposure that’s apparently available on the house site, Farm House could compare the return on investment for spending the same amount of money he’d need for insulated sheathing for a rooftop solar array, calculated at $3 a watt before any subsidies. “In U.S. Climate Zone 3, it’s possible (with a decent design) to hit net-zero energy with 2×6 (R-20) walls, no exterior insulating sheathing, and with a PV array that fits comfortably on a sun-drenched house, using better-class heat pump technology properly sized for the modest loads,” Dorsett says. He refers Farm House to a Building America research paper for more information. 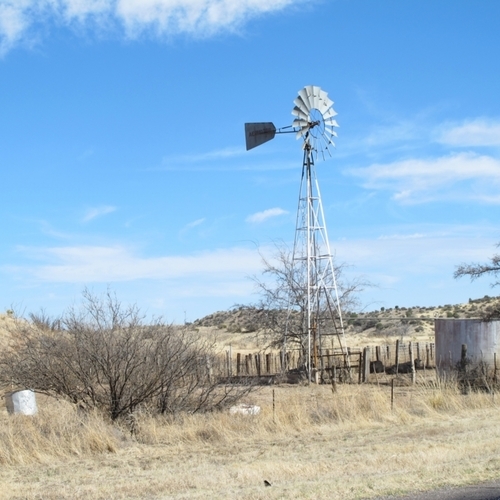 That study suggests that an R-20 wall in Climate Zone 3 — but times have changed. With those two advances in technology, Farm House could aim for the R-value recommendations that Building America suggests for a milder climate zone (Zone 2) and still hit net-zero performance. A 2×6 R-20 wall framed at 16 inches on center with a rainscreen gap between the sheathing and the siding would work; so would a 2×6 R-23 wall insulated with rockwool batts (but with no rainscreen). “So, skip the exterior insulation and concentrate the investment where it pays more,” Dorsett says. Farm House might still consider the more rigorous Climate Zone 3 recommendations for other building assemblies, while aiming for a building envelope testing at less than 1 air change per hour at 50 pascals in a blower-door test, plus a heat-recovery ventilator. A simple house shape minimizing corners would also help. Brendan Albano asks Farm House to consider the benefits of reducing the use of fossil fuels: a better insulated building will need less heat, and less heat means a lower carbon impact. “Reducing your use of fossil fuels (and other non-renewable resources) is an ethical choice from an intergenerational equity (a.k.a., ‘think of the children’) point of view,” Albana writes. “If exterior insulation is an effective way for you to do this, then it would be ethically responsible for you to add exterior insulation. 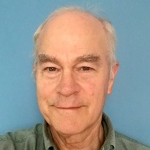 But the introduction of fossil fuels into the discussion raises additional questions, replies Dorsett. Farm House has given some thought to the environmental impact of his new home and the need to reduce fossil fuel emissions. 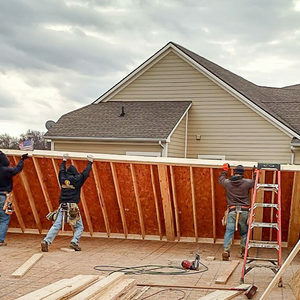 So, while recognizing that exterior foam insulation increases the whole-house R-value, the question is whether it makes “good sense.” Farm House wants to know whether a radiant barrier he’s apparently planning on including will offer the advantages he’s hoping for. Farm House says that he’s planning on “spending some serious $$$” for a Trane XV20i variable-speed heat pump. Good idea? Maybe not, says Dorsett. The smallest model of that air-source heat pump has a capacity of 2 tons, he says, and although it’s able to modulate its output, it has a turndown ratio of about 2.5 to 1, Dorsett says, “which could be sub-optimally oversized” for a higher performance house of about 2,500 square feet in Climate Zone 3. He adds that the “framing fraction” of 25% in exterior walls would account for roughly half the total heat transfer in walls. Dorsett has one more idea for reducing thermal bridging without the use of a continuous layer of foam. Farm House could start with conventional framing using 2x4s. Then, rip sheets of 2-inch Zip R to widths of 1 1/2 inch and 3 inches, and glue them to the inside of the framing to create a total stud wall depth of 5 1/2 inches. (The 3-inch strips are for doubled-top plates and other areas where studs are doubled.) 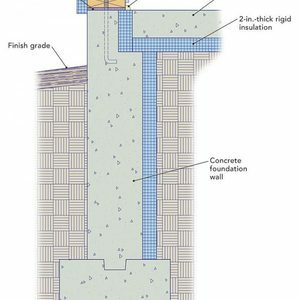 Use conventional insulation designed for a 2×6 wall. 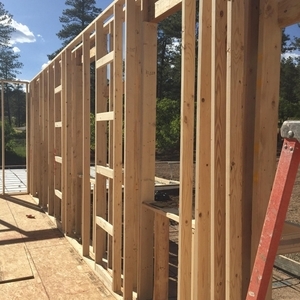 “That brings the framing fraction up from about R-4.2 to about R-14, cutting the heat transfer through the 2×4 framing by more than 2/3, and the whole-wall performance improves by about 15% compared to a 2×6/R-20 wall at the same wall thickness,” Dorsett says. The idea is derived from an article by Stephen Bonfiglioli in Fine Homebuilding magazine. 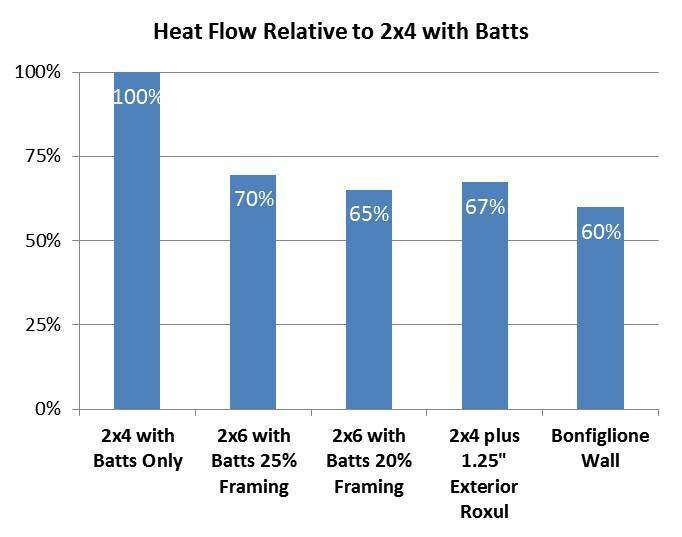 Following up on Dorsett’s suggestion, Gordon Franke writes that he ran some calculations on heat flow comparing the Bonfiglioli wall to several other options (see image #2, below). “If my calculations are correct, the Bonfiglioli [wall] insulates better than a 2×4 wall with 1 1/4 inch of exterior insulation,” he says. “One might say, ‘Well, 1 1/4 inch is too thin.’ However, a 2-inch layer only buys you a 3% improvement compared [to] the Bonfiglioli wall. There’s lots of good analysis and advice built into this Spotlight. I agree with Dana Dorsett that BEopt modeling can provide good guidance and useful sensitivity analysis around the key elements that Farm House is considering. Airtightness. Even without much information on the actual design, in my experience the continuity of the building enclosure air control layer is easiest to do on the exterior. You certainly can get this in many ways, but the Zip wall system is a good option. Another advantage of this approach is that a continuous exterior air barrier protects from wind-washing at corners. Better windows and solar shading. BEopt would certainly show this, but windows tuned by location and aspect and properly shaded give a big performance boost in Climate Zone 3. In a recent analysis I did using Climate Consultant 6, exterior shading of windows and doors alone pulled around 25% of annual hours into the ASHRAE 55 thermal comfort parameters. HVAC. All ducts and equipment should be inside the conditioned space, and the systems should be designed using ACCA Manuals J, S, and D. This was not mentioned in the Q&A exchanges, and it’s critical to high performance (energy efficiency, IAQ, and thermal comfort). Achieving a high-performance HVAC system is easy if it is identified as a driver of design and if you have an HVAC contractor who can deliver the design. hmmm...to me, the OP did not seem at all adversarial, just trying to figure this out, as am I. The chart indicates the biggest bump you get is by going from 2x4 to 2x6, presumably to get the extra 2" of insulation. The bumps after that are more incremental. Do the referenced framing percentages roughly correlate with 16" vs 24" on center? If so, the 2x6 at 24" oc is the closest to the Bonfiglioli wall. Does the Bonfiglioli wall in the chart represent a 2x4 wall at 16" oc with the strips added to make it 2x6? Also, does it matter what you fill the wall with? ie the chart assumes stud cavities filled with (fiberglass?) batts. Does filling a 2x6 @ 24" oc with dense pack cellulose still make that wall 5% less efficient than filling a 2x4 @ 16" oc Bonifiglioli (same depth as 2x6) with dense pack cellulose? It would also be interesting to understand the cost differences among the various walls. I learned a 2x4 @ 16" oc with ZipR is 10% more expensive than a 2x6 @ 24" oc with regular Zip. The second wall also has a higher effective R value...better wall, less money. I'd love to see a similar article about nailbase vs. extra insulation insulation in attic vs cost of both. "Do the referenced framing percentages roughly correlate with 16" vs 24" on center?" Yes (roughly) but it varies.. Going all out with Advanced Framing on the framing package could get it down to ~15%. "Does the Bonfiglioli wall in the chart represent a 2x4 wall at 16" oc with the strips added to make it 2x6?" I would presume that to be the case- 16" o.c., with 25% framing fraction, since 2x4 framing usually won't meet structural requirements at 24" o.c. "Also, does it matter what you fill the wall with?" "The closing comments attributed to Dana are reassuring." That was all Peter Yost commenting, not me (although we do agree.) Looking at the wall assembly performance in isolation, without considering the other factors isn't usually going to provide the optimal price/performance value for the house as a whole. Peter's comments specifying window types & sizes based on direction and shading can be a really CHEAP performance enhancement for any house, but particularly true in zone 3, where heating & cooling degree-days are roughly equivalent. Those improvements are pretty easy to tease out of BeOpt simulations with a bit of focus, and no amount of wall-R is going to compensate for ignoring the effects of window type, size, & orientation. 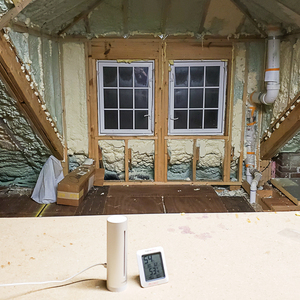 "I'd love to see a similar article about nailbase vs. extra insulation insulation in attic vs cost of both." That's easy (without putting numbers on it): R75 on the attic floor is SUBSTANTIALLY cheaper than even R38 at the roof deck (whether nailbase or not) , even when it means custom plenum trusses to accommodate the ducts & air handler below the insulation layer and to manage the deeper insulation depth & weight. because in my opinion living on the northern edge CZ3 is a much different climate than the southern edge below the humid-warm line. I do think Dana was on to something with the addition of a PV array and better air sealing. I know my own state (Georgia CZ3) has focused on ratcheting down air sealing requirements while leaving wall thickness (2x4) unchanged. I am putting the finishing touches on a home we built in the central KY, which is CZ4A. We went with exterior insulation and tons of cellulose in the attic. It was probably overkill. However, I don't regret it. My HVAC loads are almost nothing compared to other houses this size, and all that extra insulation is going to make it that much easier to get to net-zero when I start working on the solar projects. It is good to be reminded that air sealing, windows, and HVAC may be as or more important than wall insulation levels. As a novice GBA reader interested in going at least in the direction of Passive House it is easy to become fixated on the desirability of an exterior layer of insulation. However, the prospect is daunting when you actually get down to it. Do I need to contact the architect for updated plans? If I don't will the contractor know how to adjust the roof overhangs so that they still look right with the extra wall thickness? Can I convince the contractor to learn how to do this installation, especially with an uncommon material such as Roxul boards? Will the workers be able to get the window details and flashing correct? 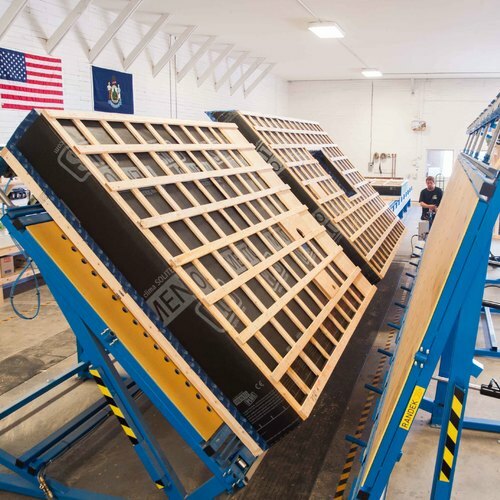 Will they be able to create a flat surface for the siding? How can I convince my spouse of the value of going through all of this trouble? Do I have enough money to pay for all of this extra material and labor? With the Bonfiglione wall you can achieve a similarly high wall R-value and use the money you save to buy better windows, HVAC, air sealing etc. The main thing you miss out on as far as I can tell is warm sheathing. With the Bonfiglione wall your sheathing will be cold. Plus the rooms will shrink a bit. Also, I would like to avoid foam if possible due to its fire-enhancing, possible off-gassing, and vapor impermeable properties. The Bonfiglione wall puts the foam only where its structural properties are useful. It is as if you have a Roxul layer with EPS stripes embedded in it. MUCH easier than trying to create a structural connection through Roxul board. And the wall as a whole remains vapor permeable unlike with a solid foam layer. In the chart, the bars aren't necessarily in order of expense or complication, and the later bars are not the result of adding things to the earlier ones, so I'm not sure it makes sense to say the biggest bump is going from 2x4 to 2x6 and the rest are incremental. It would be equally valid to say the biggest benefit to be had is going from 2x4 to the Bonfiglione wall (of the options considered). I used 25% as the percentage of framing for the 2x4 calculations including the Bonfiglione wall. In new construction there are more comparisons to be made between 2x4 and 2x6 walls with different o.c. measurements and interior vs exterior insulation layers etc. Since I'm renovating my main interest was 2x4 with exterior insulation vs 2x4 furred out to 2x6 Bonfiglione-style. Air sealing is where I have always planned to hit it the hardest. Zip Exterior, Dense packed Fiberglass or cellulose between 2x6 studs. Gaskets installed beneath plates, spray foaming the roof line , rim joists, etc...... and if that weren't enough, I plan to spray an elastomeric caulk into all the joints at 1750 psi. I'm sure it's overkill, but I only get one shot. I'm buying the best windows and doors that I can afford (wood with aluminum cladding). About 2/3rds of the windows are covered with a 10' deep porch roof line or face North/North East and will receive very little direct sunlight. Wouldn't be a farmhouse without lots of wrap around porches. The house will be near Greenville, SC. Here's a good link for figuring out your heating/cooling loads. Drill down on the map to upstate SC. Watch out for the big peach! 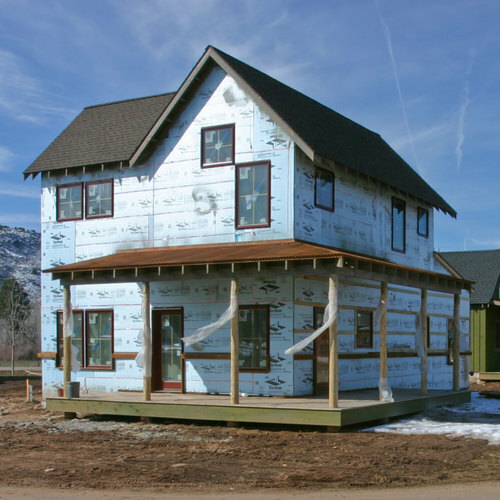 In this article the author, Scott Gibson, writes: "A 2×6 R-20 wall framed at 16 inches on center with a rainscreen gap between the sheathing and the siding would work; so would a 2×6 R-23 wall insulated with rockwool batts (but with no rainscreen)." I live in CZ3 Coastal, with 4300 heating degree days a year and December-January lows averaging 42 degrees, very rarely reaching 32 on the coldest nights of the year. Local contractors here have not built homes with exterior insulation (and possibly without rain screens). For the 1,232 sq. ft. duplex I will build this summer I was already planning to install mineral wool batts in the 2x6 wall. Is the author saying I can skip the rain screen? If not, what would be a relatively foolproof/simple rain screen detail for my local contractor? Thank you.